On July 1, 1972 George Mason College officially became independent of the University of Virginia and became known as George Mason University. On its own now, it was up to the newest regional university in the state system to distinguish itself. During the six-year period from 1972-1978, George Mason University witnessed three presidents; Dr. Lorin A. Thompson, Dr. Vergil H. Dykstra, and Dr. Robert C. Krug. Dr. Thompson served as Chancellor of George Mason College before becoming the first President of George Mason University. 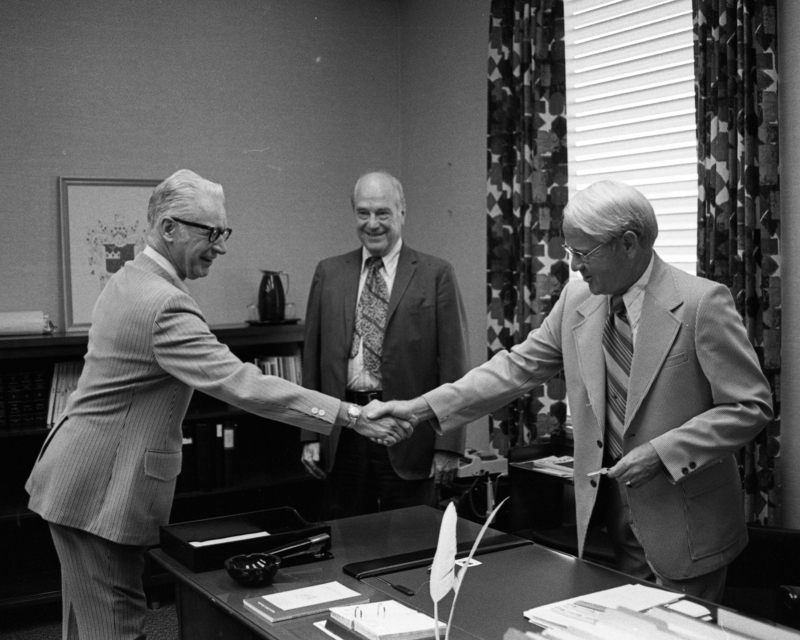 Thompson, serving out the end of his temporary appointment, handed the reins over to Dr. Vergil Dykstra in July 1973. Dykstra, a university administrator from Northern New York, promoted social change on the campus. Dr. Dykstra’s unexpected resignation four years later prompted the assignment of Robert Krug, George Mason’s Vice-President for Academic Affairs, as President. Krug served as Interim University President for one year as a search committee looked for a permanent replacement. The mid-1970s was a period of challenges, change, and rapid growth for the University. George Mason made the committment to provide equal opportunities within the organization for faculty, students, and staff, with Dr. Dykstra creating high-profile minority affairs positions within the University's administration. Significant growth took place on the campus as landmarks such as the Student Union Building, Robinson Hall A, and the Fenwick Library Tower were constructed. The first housing facilities on campus, the Student Apartments, opened in October 1977. George Mason University also opened its first satellite location, the North Campus, in 1972. Two Mason Faculty members discovered the archives of the Federal Theater Project, a Works Progress Administration initiative during the Great Depression. The papers were brought to Fenwick Library to be used by researchers from all over the country and the world. Enrollment more than doubled from 4,166 to 10,767. Despite all the positive change and growth that was happening at George Mason, there were indeed some challenging episodes as well. Prior to Dr. Dykstra’s reforms there were those, both within and outside the university community, who questioned Mason’s dedication to equal opportunity. The University supported the start-up of a private day-care facility on campus, only to have its licensing status cause a controversy. And a member of the faculty created a stir among the students, faculty, and administration by suggesting that students in his class make a public statement at a political rally for a very powerful politician. At the beginning of this brief period, George Mason found itself a brand-new institution among several already-established ones in the Commonwealth. During the period, it took early steps toward forging its identity as an important institution in the region which aspired to larger things. By the end, the University found itself ready to choose a leader who would take it farther than it ever imagined and cement its position as an integral part of Northern Virginia.